They thought, and we agreed, that it’s only natural that a route planner will give this type of additional service. So, with the years of experience in vehicle routing software our R&D team has created an Online Territory Planner. This online tool is designed to divide your area into balanced territories. You can do this task once a year as some companies usually do, or use this Territory Planner more frequently, whenever you have more customers or your area grows bigger and harder to handle. Adding a new vehicle is almost a must if you don’t reorganize your territories when you add new customers. But you will soon realize that it’s not always necessary and you can save resources if you plan your territories again, considering the additional customers, and evaluate your current fleet performance. Another way to use this tool is to try what-if scenarios, creating different territories and choosing the most efficient result that meets your needs. No one will try so many scenarios unless he has an automatic tool that does the work for him, otherwise it’s so time consuming that it’s almost not worth the hours invested in this task. 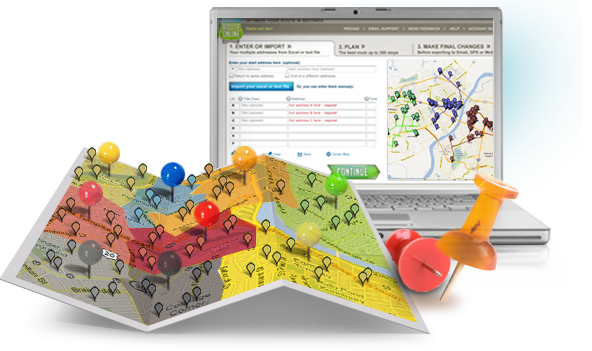 In short, balancing territories just became easier and simpler with our online territory planner. When your territories are set, you can go back to using our route planner to optimize your routes. Our Online Territory Planner is still a beta version and at this point we give 100 free credits for 30 days. A credit equals an address so you’ll be able to map 100 addresses as many times as you like within these 30 days. If you need our assistance, please contact us at support@myrouteonline.com.